The Rebel Sweetheart. : Spotlight | Human Heart Nature 100% Natural Healthy Lotion. Spotlight | Human Heart Nature 100% Natural Healthy Lotion. Last week, I had the honor of receiving this wonderful gift from Gandang Kalikasan Inc. (Thanks Sara and Reby for this surprise!) It's a box filled with Human Heart Nature goodies - some of their newest products that were launched during the last Magalogue Turnover. Natural Feminine Wash in Powder Cool, 100% Natural Kids Bath Soap. I'll be featuring every single one of these products, starting with the 100% Natural Healthy Lotion. I've been using it since the day this box arrived at my place and I must say, I am loving this new Blossom Beauty variant a lot. It comes in a refreshing fruity floral scent that's not too mild and not too strong. Plus the scent lingers on the skin for hours. I actually find the Blossom Beauty better than the other two variants of the Natural Healthy Lotion. 100% Natural Healthy Lotion in 200mL and 50mL bottles. Like its predecessors - the Berry Bliss and Vanilla Delight variants - this new product contains no harmful chemicals, no parabens, no mineral oil, and no synthetic fragrances. But what gives this new lotion the edge is that it's packed with twelve, yes twelve of nature's best nutrients and antioxidants. These are: Vitamins A, B1, B2, B9, B12, C, E, K, amino acids, essential fatty acids, phytosterols, and zinc. That's quite a lot, huh? Remember, all lotions can moisturize. But not all of them are healthy! This lotion also contains soybean oil that protects your skin from harmful UV rays and a 24-hour moisture booster from sugarcane compound. Not to mention the already remarkable all-natural blend of aloe vera leaf juice and sunflower and avocado oils that locks in moisture and makes the skin soft, smooth, and beautifully radiant. - Made with all-natural ingredients. - Contains no harmful chemicals. - Fruity, floral scent that lingers on the skin. - Loaded with nutrients and antioxidants. - Softens, smoothes, and moisturizes the skin. - This is an organic product, so no SPF. - I know there are people who are allergic to soy. Be wary, as this contains soybean oil. I have never heard of this brand and am not sure that it is sold in the United States-or if they will ship to the US. I think I might prefer a thinner consistency lotion as it would be easier to spread over the body. If I ever see it around I will pick it up and try it. I never knew soy oil was good for your skin. 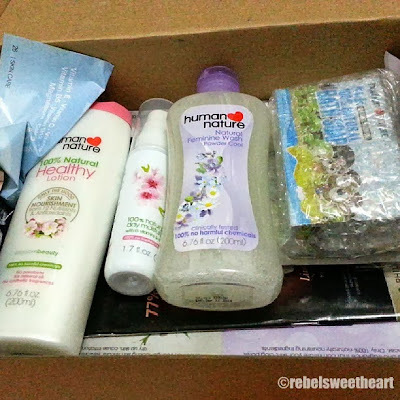 I was able to try Human Nature shampoo during last Pinas vacay and the scent was amazing! We really ought to patronize all organic Filipino products. Thanks for sharing their new range! This looks like a really nice lotion! I think this one's better than the regular ingredients because it's all natural. It's very difficult to find a lotion with no mineral oil. I could go on about it but this is your blog of course. This sounds like such a good product. I will bookmark this as one to get. Thanks! Human Nature products have recently become available at Robinsons Supermarket, and every time I do my grocery shopping, I always check for new HN products to try. I love their Cool Burst all natural spray sanitizer and their Kids Natural Shampoo & Body Wash. I'd like to try this Healthy Lotion, too.